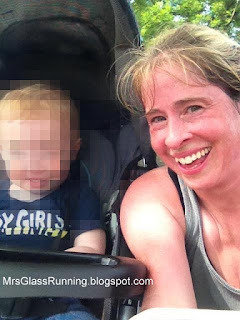 If you've never run with a toddler, then let me fill you in a little. You have to bring a lot and I mean a lot of stuff. I had to pack the stroller (which involves taking the wheels off to get it to fit in the trunk). I needed the rain shield (just in case) we were away and it started raining. He needed several kinds of snacks. I needed water. He needed water. And I brought extra water because I knew it was going to be hot. I had to bring some diapers just in case. Once I finally got everything loaded, we drove down to the River Front. And I'm thinking to myself, it would have been so much easier to just walk out the door and run. But I wanted to see what we could do with the jogger. He made it 7 miles on a run a few weeks ago. Surely he could make it 8 (which was the distance on my training plan today). Once we parked, I had to assemble the stroller and pack everything in it. Once I got him situated we were off. By about mile 3, I was struggling. For real?!? He was just fine and enjoying the scenery, but I was sucking wind bad. It was really humid today, and I'm not used to running in the warmer temps yet. I actually thought about turning around and making it a 6 mile run. But I kept going. Around 4ish miles, I decided that if I made it to 5, then I would have to make it 5 back, and we could actually make it to double digits. Of course a toddler's mood can change at any moment, but he was enjoying the cars, the geese and the squirrels. So we made a couple of loops around City Island to tack on some miles. He learned that if he moved his body back and forth (as if you were on a swing) that he could propel the stroller forward a little. So of course I had to speed up to keep up with him (ha). At times, he had me running sub 9:00's. Overall for the run, my average pace was 10:43 running time. I was pleased with that. He ate a huge bowl of cheerios, a box of raisins and some pretzels before this run was over. He must have been fueling for both of us. I thought it was really sweet on our 3 miles back up the River to the car, since we were facing traffic, he was waving at everyone. It was cute to see this little hand sticking out waving at people. Overall, it was a good run. It was tough. But it's done. Our first Double Digit run together. :) I'm not sure how many double digits will be in my future, but I'm glad to know I could do it if I had to. this is a tough task to move along joggler, you have to put hard work to run with it.